SANTA’S VILLAGE – GONE WILD! is a revealing look at some of the fun, hilarious and outrageous stories that took place during the over forty years Santa’s Village in Dundee, IL was open. Summers spent working at Santa’s Village was a right of passage for thousands of high school kids growing up in the Chicago suburbs. It was to teach responsibility and life lessons, while bridging the gap from adolescence to adulthood in a safe environment. We can now lift the curtain and show what REALLY went on… Christopher Dearman shares some of the behind-the-scenes stories of his two seasons spent working in the hot summer sun, and all the hijinx and debauchery that went along with it. He also collects quotes & memories submitted by numerous employees that will paint an unforgettable overview of some of the coming of age tales that could only have happened if you were one of the lucky ones to have worked at Santa’s summertime home. With a historical outline spanning the nearly five decades the park was open, you’ll learn some fascinating and eye opening details never revealed before including: * Shocking secrets of the frozen North Pole. * A candid interview with Santa Phillip Wenz. * Stories from the notorious after-hour parties. As well as answering questions like: * How much hanky panky went on at the park? * Did a former employee steal enough $ to buy a car? * Were there contests to cause “protein” spills? * Did the Fire Truck ride really have no brakes??? Completely unauthorized and uncensored Santa’s Village – Gone Wild! unveils some of the secrets and stories of summers spent sweating in the hot sun working for minimum wage and food tickets that would make just about anyone “go wild”. A must read for anyone that ever visited the amusement park, or for those just curious to know what goes on behind-the-scenes of one. 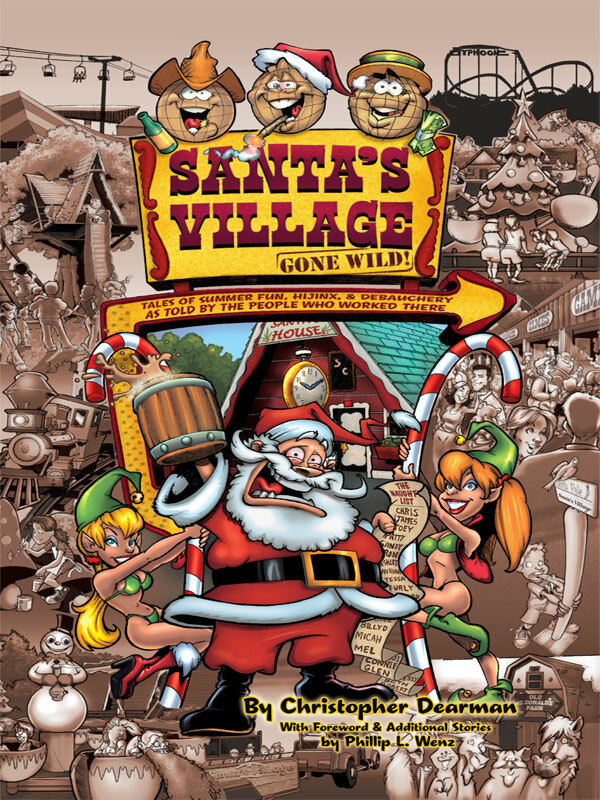 You can purchase the book online from Amazon at http://www.amazon.com/Santas-Village-Gone-Wild-Debauchery/dp/0984453903/ref=sr_1_1?s=books&ie=UTF8&qid=1313543684&sr=1-1.